Discover how to transform premade fabric panels and thread into one-of-a-kind art quilts! Award-winning quilter and fiber artist Joyce Hughes will show you how to use a variety of decorating and customizing techniques – from thread painting to trapunto – to add dimension and texture. Complete 6 step-by-step projects with full-color photography that feature seasonal panels, beautiful florals, holiday designs, and gorgeous landscapes. 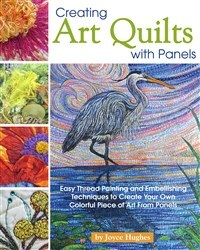 Thoroughly ‘user friendly’ in organization and presentation, “Creating Art Quilts with Panels” will prove to an immediate and enduringly popular addition to personal, professional, and community library quilting/needlecraft instructional reference collections. Joyce Hughes is an award-winning quilter, McCall’s Quilting Quilt Design Star, and fabric industry consultant. A self-taught fiber artist, she has single-handedly elevated printed panels to quilt art. Her very first art quilt won a blue ribbon when it was entered into competition, an honor that has since led to dozens of awards, recognitions and opportunities in the quilting world. Joyce continues to create and design one-of-a-kind quilts and handbags, while maintaining an active schedule of lectures and workshops teaching her designing and quilting techniques.